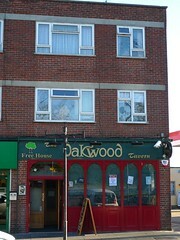 Free house near Oakwood Station, all the way up there at the top of the Piccadilly Line. It's a fairly basic kind of pub (a one-room shop conversion on the end of a terrace next to a bookies), but our pre-Tube-Walk research suggested it was the best in the area. It's certainly not awful, but not worth much of a journey. Kake, Ewan, and other Tube Walkers visited on a Sunday afternoon in January 2008 after a wander around Trent Park. The only real ale available was Courage Best, dispensed from a single lonely handpump at the end of the bar. A couple of flatscreens were showing sport; this was replaced by music once the sporting event was over. Two pints of Courage Best and one of Strongbow came to £7.70. A sign on the side of the pub advertised Thai food; don't know what times it's served. It has a few sofas, and I think some kind of beer garden out the back. There are murals of film stars on the walls; see dansette's photos. Last visited by Kake, Ewan, doop, and other Tube Walkers, 13 January 2008. Last edited 2017-02-05 19:26:35 (version 5; diff). List all versions. Page last edited 2017-02-05 19:26:35 (version 5).